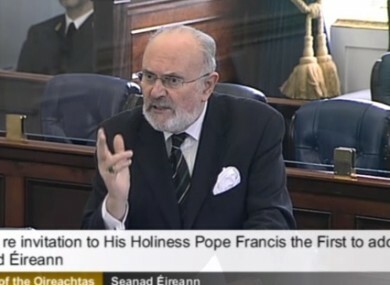 Senator David Norris speaking today in the Seanad. THE SEANAD TODAY passed a motion to invite Pope Francis to visit Ireland. The Committee on Procedures and Privileges had already made a unanimous decision to add His Holiness Pope Francis to the invite list of distinguished visitors to address Seanad Éireann. Senator David Norris’ motion said he believed a visit by the Pope would “lift the spirit of Ireland” and would begin the “healing process”. While Norris said he does not agree with many of the Church’s teachings on homosexuality or women priests he said that he believed that the Pope had “changed the entire climate of debate within the Church” and was allowing for “genuine dialogue” to begin. He added that it was “perfectly clear” that sexuality was now on the “back burner” when it came to the Church stating that Pope Francis was now dealing with real issues. He said he was not under the illusion that he was going to campaign for gay marriage or women priests, but said he felt his “goodness” when he first saw him on the balcony in the Vatican. “I felt a strong emotional connection with him then…. and when he refused to be decorated like a Christmas tree,” he said, commending his modest lifestyle. “I believe he would give this country a lift and we need a lift,” he said. He added that reason he came up with the idea to extend an invite to Pope Francis was because he felt there are very few leaders that have vision, and he believes he does. Norris added that he thought Pope Francis has “spotted the ice berg and is trying at least to turn the Titanic around”. The use of “bullying language” of the Vatican that is typically used is disappearing, said Norris, stating that Pope Francis is a “man of genuine Christ-like ability”. He said he would be humbled to be in his presence if he accepted their invitation. The motion was supported by a number of other senators, such as Sean Barrett, who seconded the motion. He said he too would disagree with the Church’s thoughts on homosexuality, women priests and the LGBT community, but said that was a debate for another day, but said this was a commendable motion. Senator Labhrás Ó Murchú admitted that when he first heard about the motion he had his doubts but said he now thought that it “would be a worthwhile development” as it “has to start with the premise of openness,” he said. Senator Feargal Quinn supported the motion also, stating that it he might be bias as he received the Papal Knighthood twenty years ago, adding, ” he is also the first Pope that actually younger than me”. The motion was carried by members of the Seanad. Norris asked that the Taoiseach and Tánaiste do all they can to make advancements. Poll: Would you like to see Pope Francis visit Ireland? Email “RSVP: Senators want to invite Pope Francis to Ireland ”. Feedback on “RSVP: Senators want to invite Pope Francis to Ireland ”.